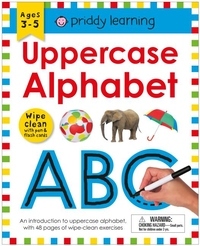 This Uppercase Alphabet wipe-clean workbook is a fantastic way to help elementary school children learn letter formation and develop their writing skills and it comes with a wipe-clean pen. An extended and revised edition for 2018, this 48pp spiral-bound book comes with a pen and wipe-clean pages; tips for holding the pen correctly and good writing posture; a three-step system to help children recognize, trace, and write each letter; and lots of room for practice. Illustrating the pages are colorful photographs and illustrations, and there are fun activities so children can put their newly developed knowledge and fine motor skills into practice. Afterward, wipe the pages clean for when your child is ready to try again!